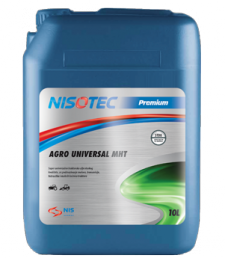 NISOTEC AGRO UNIVERZAL MHT is a multi-purpose, super universal tractor oil (STOU) for lubrication of high-performance agricultural machinery. Guarantees a high performance of gasoline and diesel engines, transmissions and differentials, wet brakes and hydraulic power transmission equipment in tractors and other agricultural machinery. Provides a stable and long-lasting operation of the engine and other devices in all but especially designed for most severe conditions. NISOTEC TRAKTOL PREMIUM SAE 10W-30 is a premium “universal tractor transmission oils” (UTTO) designed for use in most modern equipment.and tractors of new generation, in which are functionally tied hydraulics, transmissions and wet brakes, and the whole system is supplied with oil from the same common one or at most two cases. It can be used when SAE J306 80W and 85W grade is recommended. 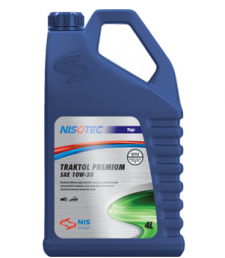 NISOTEC TRAKTOL PREMIUM 10W-30 have been evaluated against the latest requirements of leading tractor and transmission manufacturers including John Deere, Massey Ferguson, Ford-New Holland and GM Allison. 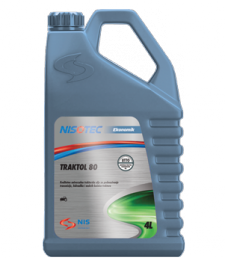 NISOTEC TRAKTOL 80 is a universal mineral base tractor hydraulic transmission oil (UTTO) intended for lubrication of tractors and other agricultural machinery, operating with functionally linked hydraulics, transmission and wet brakes, and where the manufacturer recommends the use UTTO lubricants.